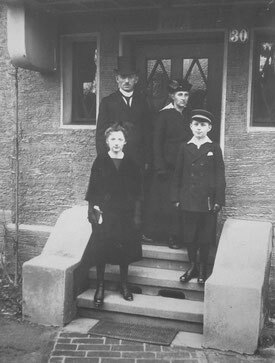 The Frick family in front of their house in Zweibrücken. Walter Frick was born October 23rd 1908 in a small city called Zweibrücken, which is located in the south-west of Germany (near the border to France). At that time this part of Germany was called "Rheinpfalz" and belonged to the kingdom of Bavaria. Walter's parents were Hugo Frick, a teacher for primary school, and Emma Frick (daughter of John Schumacher and born in Callicoon, NY). Walter had an older sister named Hedwig (*1907). From 1915 till 1919 Walter went to primary school in Zweibrücken and then changed over to secondary school where he acquired his general qualification for university entrance in 1928. He directly applied at the conservatory of Munich and succeeded: being not even 20 he started studying piano and composing in the far city of Munich and one year later he successfully applied for conducting too. But 1929 also brought a first blow of fate: after being ill for a long time his father Hugo died just a few days before Christmas. In Munich where meanwhile also Hedwig was studying (arts and art pedagogics) Walter got to know the opera student Luise Frölich and soon the two of them became lovers. 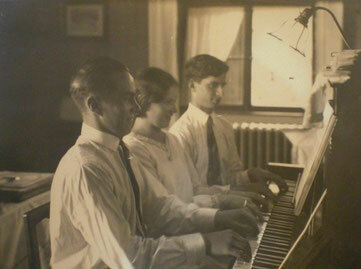 Piano with six hands - making music together around 1930. In 1933, the year of Adolf Hitler's takeover, Walter finished his studies in Munich. His conducting teacher characterized him as an „extraordinarily intelligent young musician“, who either was „hard-working and ambitious“ and „a remarkable modest personality“. With these references Walter moved to Rostock (eastern sea) where he got a job at the opera house. First he worked as a "Korrepetitor" (he accompanied singers in training), later he also got the chance to do what he always wanted to do: conducting. Luise finished shortly after him and so they made their ways together in the city which was known as the “Nordic Bayreuth“ in these days - because of its outstanding Richard Wagner-productions. In 1936 Walter and Luise got married in Pirmasens. For the two of them the time between 1933 and 1938 was a period full of luck and success both job-related and private. Easter 1935 they got engaged, in august 1936 they celebrated their marriage in Pirmasens in Rhineland-Palatinate where Luise's brother worked as a pastor. But not just Walter and Luise married in 1936. 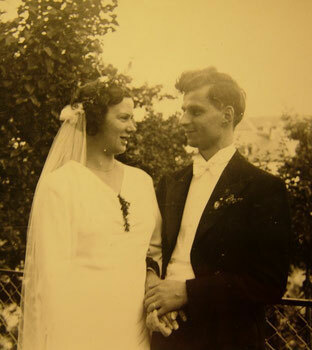 It was Hedwig, who got wed either - unfortunately to a soldier of the SS, called Armin Beilhack. In 2013 I found this treasure in my grandmother's old jewel case. The lines say: "Little ring of gold, give to me this tiny heart; attach it to mine so no one can tear it apart." 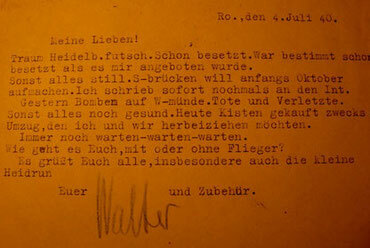 One of the last preserved letters of Walter - addressed to Hedwig and Armin Beilhack. In 1939 war began. The exact reason for making Walter and Luise leave Rostock is still not known. In a curriculum vitae which Hedwig wrote about Walter years later, it is to be read that the opera house dismissed Walter for he wasn’t a member of the NSDAP. But this is not true - in 2016 I found out, that he in fact was a member, just like almost anyone was. Anyway - from reading his letters I know that Walter applied as a guest conductor in several German cities, among others Kaiserslautern in Rhineland-Palatinate and Heidelberg which is also in southern Germany. But unfortunately he was rejected by all places, often with a pre-assembled form. At the same time he also should get recruited for war – another reason for him to find a new employment as fast as possible. Maybe this could have preserved him from getting recruited? Such a sensitive person he was, he never would have been able to fight in war. Finally Walter decided to go to Berlin for some further education in school and church music – and this decision can in fact be seen as his death sentence. 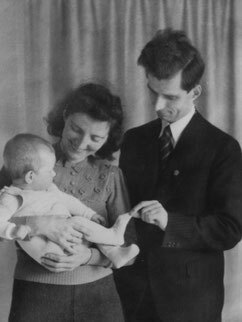 He probably chose Berlin because his sister Hedwig was living there together with her husband in an SS-colony. This made it possible for Walter to have an accommodation until he could find himself a small flat. Meanwhile his pregnant wife Luise moved to her brother Heinrich and lived with him and his family in the vicarage of Pirmasens. 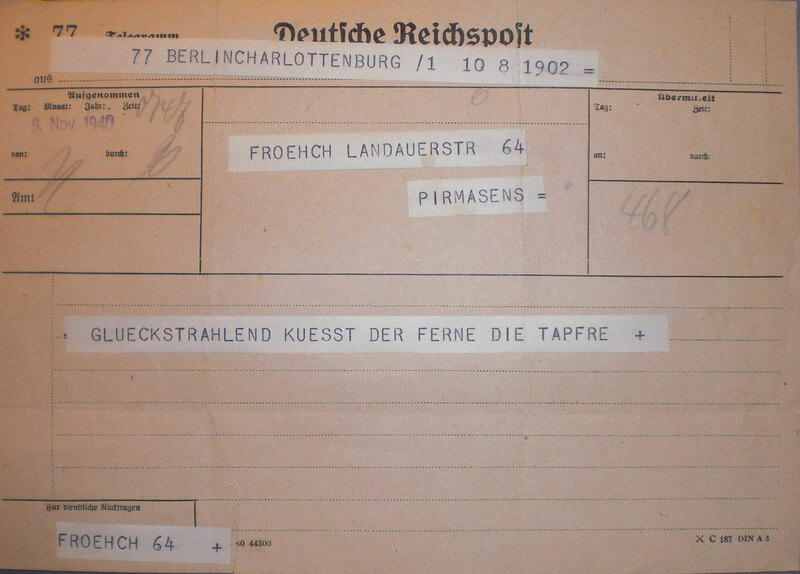 When son Achim was born Luise received a touching telegram. 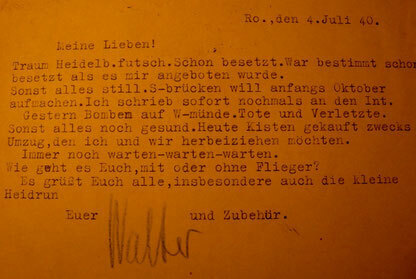 When his son Achim, my father, was born in november 1940 Walter sent a telegram from Berlin. It is the most moving document preserved. „Blissful kisses for my brave one from afar“ would be a corresponding translation of the words Walter wrote to his beloved wife. If Walter ever saw his little son? In a letter he wrote that he tries to be home for Christmas 1940 but it‘s not documented if he was able to realize that. It was in spring 1941 when Luise heard that Walter was brought to a sanatorium. 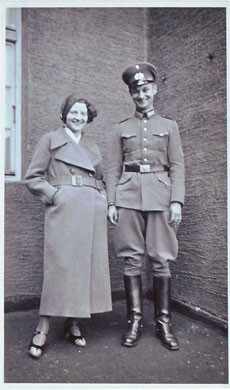 Hedwig and Armin B. in the 1930s. According to Walter's death certificate it was the „sanatorium of Dr. Wieners“ in Bernau near Berlin he was brought to. 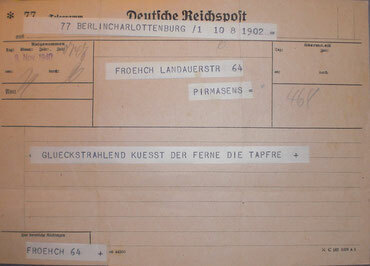 But all information on the death certificate is penned by - Armin Beilhack. The following report is based on what Walter's sister Hedwig told my father. It was decades after Walter’s cruel death when she finally managed to tell what she knew. And my father got at least a part of all the answers he had longed for since his early childhood. The last photograph of Walter Frick - with Hedwig and her daughter Heidrun. Systematical killing or “wild euthanasia”? Hedwig would never speak of what happened during this night – until my father took her to task in the late 1980s. The SS soldiers brought Walter to Dr. Wieners‘ sanatorium in Bernau - and Luise would see him one last time, the doctor even told her that Walter soon would be back! But in one of the very few conversations about this topic she had with my father she told him also, that Walter had seemed so doped and absent on that day. And this assumption of her's turned out to be more realistic than Luise ever could have guessed. NS-"euthanasia" - as predominantly known - was the systematical killing of people with a physical or mental disease, which was executed until august 1941. Walter has been killed exactly in august 1941. Since I couldn’t find hints for a deportation from Bernau to one of the centralized "death clinics" in the German Reich it seems likely that my grandfather is a victim of the so called „wild euthanasia“ in which patients were killed right in the respective sanatoriums they where in - with overdoses of morphine or by simply starving them. My grandfather's death certificate says that he died from „sad mood, depression and exhaustion“. The last one, exhaustion, has been one of the most current reasons given in conjunction with letting people starve. It literally can be seen as a kind of code word or an internal synonym for killing patients directly. When I contacted the cemetery of Zweibrücken in 2011 - where a family grave exists - I found out that there hadn't been a burial in 1941. Walter's name is written on the gravestone and there is a notice to be found in the cemetery’s documents - but neither a registration nor a permission for a burial can be found. "Walter Frick, opera conducter, died after long illness." The death notice in the local newspaper informs about a burial - but it doesn't name a date. 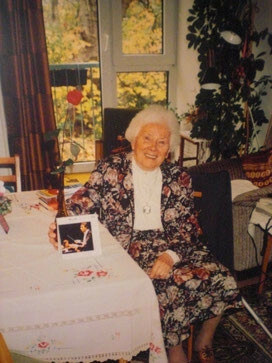 My grandmother Luise in the late 1980s. After Walter's death Armin Beilhack sued against his wife - his aim was to get divorced. But since Hedwig publicized the affair he had, Armin got displaced and had to fight on the Russian front near Minsk. In summer 1943 he was hit by particles of an exploding mine and died on the same day - before the divorce became final. Hedwig’s countersuit was successfull and so at least she lived as a divorced woman – and probably also as a broken one. Walter’s and Hedwig’s mother Emma moved into a small flat in Zweibrücken where also Hedwig and her little daughter lived for a while. Emma Frick died in the 1970s almost at the age of 100. 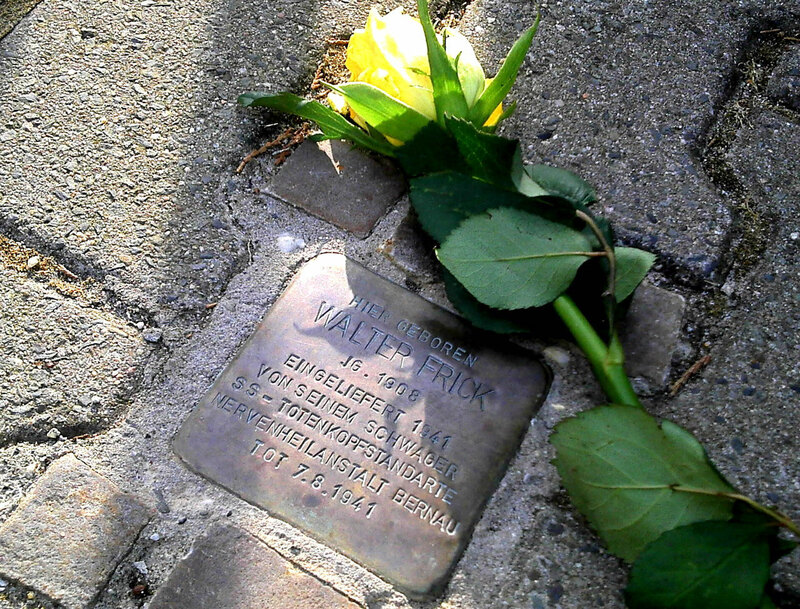 In 2012 we placed a "Stolperstein" for Walter Frick. Walter Frick was murdered at the age of 32. The tragical story about the circumstances of his death had in fact been a secrecy until I started my research - about 70 years later. Since I turned 18 I felt a deep sympathy for the grandfather I never had and I noticed that there must be more than I, than we all knew. To remember my grandfather in an appropriate way, me and my family laid a so called „stumbling stone“ ("Stolperstein", click for further information) for him. It is placed in front of the house in Zweibrücken Walter was raised in. *The Nazis called sanatory's patients "lifes not worth living“ and this is also what the name of this website picks up - "lebenswertes Leben" means "life worth living".